Pads for all patients. Save valuable time in an emergency with preconnected pads for use on adults and children. SMART Pads II eliminate the expense of having to purchase different pads sets for different patient types. What’s more, SMART Pads II enable the FRx to keep pace with responders by adjusting to their actions. The FRx provides a mobile, wireless solution for data management using the Palm® handheld platform. It features an infrared data port for easy transmission of information without cables or hardwire compatibility issues. Simply insert the Infant/Child Key into the FRx to signal to the device that you’re treating an infant or a child. 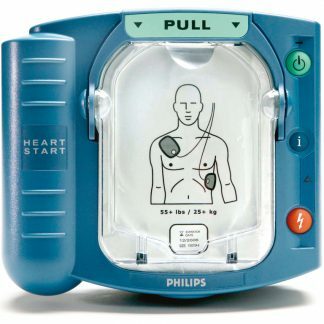 The defibrillator adjusts to provide special pads placement and CPR instructions.The pads icons also flash to show you the appropriate pads placement and the device reduces the shock energy to a level more appropriate for an infant or a child (less than 55 pounds or 8 years of age). The HeartStart FRx offers the industry’s first and only CPR Coaching feature for use on adults and children. CPR Coaching reminds the responder of CPR basics through detailed voice instructions. 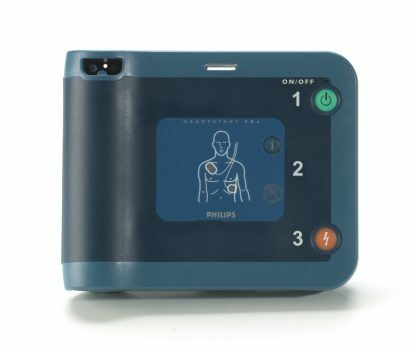 The Philips FRx Defibrillator is the newest member of the HeartStart family of defibrillators designed with new technological advancements to help in treating the most common cause of Sudden Cardiac Arrest (SCA). The Philips HeartStart FRx Defibrillator is designed to be easy to use, rugged and reliable for those who get there first. On the scene with law enforcement, on the field with student athletes or on the job with employees, the FRx Defibrillator is the solution for treating SCA from ventricular fibrillation in environments and conditions too demanding for many other defibrillators. The HeartStart FRx Defibrillator was designed to be as easy to use as the HeartStart OnSite Defibrillator and shares many of its features, including CPR Coaching and intuitive icon-driven operation. Although small and lightweight – just 3.5 pounds – the FRx is equipped to direct you through the resuscitation of a SCA victim. The HeartStart FRx guides you through every step with clear, calm voice commands and descriptive visual icons. The FRx even reminds you to call emergency medical services (EMS). Pressing the blue i-button activates HeartStart CPR Coaching for assistance with CPR. The flashing icons and the Quick Reference Guide can be used to lead you through the defibrillation steps – even in situations where hearing voice instructions is a challenge. 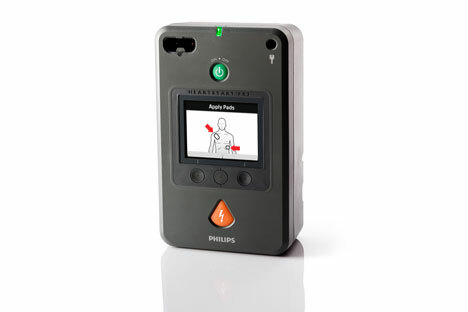 Once EMS arrives, hand-off is fast and easy because the FRx is compatible with advanced defibrillators like the HeartStart MRx. With HeartStart adapters, our pads can be plugged into devices from other manufacturers to ensure continuity of care.